Gage Bowen is in the 7/8 open age group for West Michigan Pursuit. The second tournament of the 2014-2015 MYWA Western Region was hosted by East Kentwood. West Michigan Pursuit brought 23 grapplers to compete with eight entering Novice and the rest entering the Open division. WMP also had three enter into the Manton Madness tournament in the North Region. This is an Open tournament only due to the trophies offered. Our team battled 76 times with 47 ending in victory. 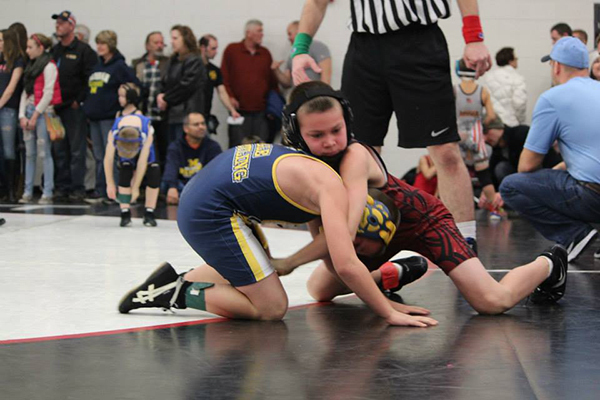 This past weekend placed 18 of our young grapplers. 4th Place medalists include Kaden Schmid in the 9/10 Novice age group in the 75 lb wt class and Brandson Wood in the 7/8 Open age group in the 46 lb wt class. 3rd Place medalists include Hannah Pienton in the 11/12 Novice age group in the 90 lb wt class, Josh Vasquez in the 7/8 Open age group in the 55 lb wt class and Caleigh Wood in the 4/5/6 Novice age group in the 40 lb wt class. 2nd Place medalists include Lee Braun in the 7/8 Open age group in the 58 lb wt class, Casey Eberspeaker in the 7/8 Open age group in the 64 lb wt class and Bryant Vandermark in the 7/8 Open age group in the 61 lb wt class. Champions are Gage Bowen in the 7/8 Open age group in the 97 lb wt class, Chayson Eberspeaker in the 4/5/6 Open age group in the 52 lb wt class, Luke Egan in the 7/8 Open age group in the 52 lb wt class Landon Foss in the 7/8 Open age group in the 49 lb wt class, Jayden Marcano-Cruz in the 4/5/6 Novice age group in the 46 lb wt class, Kameron Ogden in the 7/8 Novice age group in the 55 lb wt class, Blake Peasley in the 7/8 Open age group in the 61/64 lb wt class, Lucus Pienton in the 13/14/15 Open age group in the 138 lb wt class, Zak Schmid in the11/12 Open age group in the 133 lb wt class, and Maston Wood in the 9/10 Open age group in the 110 lb wt class. Special recognition to Maston Wood for his honesty and strong moral fiber. He found $350 dollars on the floor and turned it in to the head table. The cash was returned to the very appreciative owner and was given a reward for his actions. Thank you Maston for being such an honest young man! Your parents and your coach are very proud of you.